The quadruple crochet stitch is four times as high as a single crochet stitch, which means your project will work up four times as fast -- making it perfect for big projects like afghans, rugs and sweaters. With that said, the tall and slender posts, or vertical parts, of quadruple crochet stitches will have equally tall and slender gaps between them, so if you want a dense, thick fabric with less potential for gapping, you’d be better off doing shorter stitches like single- or half-double crochet. 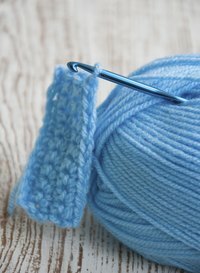 To work a quadruple crochet stitch, start with one loop of yarn around your crochet hook. Yarn over -- that is, wrap the working end of the yarn around your crochet hook -- three times, so you have a total of four loops on the hook. Insert the crochet hook into a stitch or foundation chain from the previous row, yarn over, and draw that loop of yarn up through the stitch. You should now have five loops on the hook. Yarn over and pull that loop through two of the loops already on the crochet hook; you should have a total of four loops left on the hook. Yarn over and pull that loop through two more of the loops already on the hook, leaving you with three loops on the hook. Continue yarning over and pulling through two loops until you have just one loop left on the hook; this completes a quadruple crochet stitch. If you work a row of quadruple crochet into a work already in progress, you must chain four stitches at the beginning of the row. That creates enough slack along the edge of the piece for your row of quadruple crochet to sit evenly horizontally across the piece. If you chained fewer stitches -- say, two or three, or even none at all -- your quadruple crochets would be squashed inelegantly in the corner, creating bulges and bunching in the crocheted fabric that you cannot fix later. If you’re working the quadruple crochet stitch into a foundation chain -- the very first row of stitches in your work -- work your first stitch into the fifth chain from the hook. Or, to put it another way, chain four more than the number of quadruple crochets you want to work into the first row. In essence, those four extra chain stitches become the turning chain for that first row, helping create an even edge along the side of your work. Many experts agree that you should chain four stitches to create a turning row for quadruple crochet, and that in a foundation chain, you should work a quadruple crochet into the fifth chain from the hook. But sometimes there are differences of opinion; for example, the book “Crochet Basics” from Vogue Knitting recommends using those figures for a triple or treble crochet, which would mean you’d have to add one more of each for a quadruple crochet. That works out to five chain stitches as the turning row for a quadruple crochet and working into the sixth chain of a foundation row. These differences of opinion are fairly common; for example, some books or crochet experts recommend using two chains in the turning chain for a double crochet, while others recommend using three chains. Every crocheter’s stitches turn out a little different, so try both methods and decide which looks best in your work.